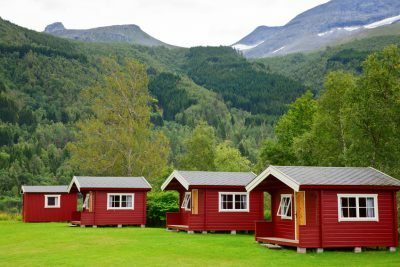 When it comes to camping in a cabin, many assume that the spring, summer, and fall are the only suitable times of year. However, camping in a cabin during the winter is an exciting and unique experience that everybody should try at least once in their lives. But before you start researching cabin rentals, it’s important to know the facts. Don’t fall for these three misleading myths about wintertime cabin camping. While the outdoor temperature can indeed be brisk, the vast majority of cabins and vacation rentals are equipped with some sort of insulation and heating element to provide warmth during the chilly season. These range from rustic wood fireplaces to full furnaces. If you’re concerned about staying warm inside your cabin during your trip, simply call and ask the staff or check for information on the campground’s website. But rest assured that with any type of heating element will most likely be sufficient to keep you and your entire family warm and toasty throughout the duration of your trip. This is another common misconception, but in most cases, it’s not true at all. Many campgrounds offer reduced rates for the off-season because the fact is, winter camping simply isn’t for everyone. But if you’re the type that likes roughing it even in extreme temperatures, you’re the perfect candidate to receive discounted rates on even the most high-end cabins. And, oftentimes, there are even further discounted rates for reserving a cabin for a certain number of nights, such as a week or more. Of course, the one exception to this trend is during holidays and/or special events. Plus, if the cabins are near ski resorts, the winter might not be an off season after all. But otherwise, make sure to be on the lookout for these reduced rates once winter hits! Finally, this myth is as common as it is untrue! Hiking is the most popular activity to participate in while camping, but there are a wide range of activities that are absolutely perfect for camping in a cabin during the winter months. These include ice fishing, snow shoeing, wintertime hiking (with hiking boots, of course), skiing, and simply gathering inside the cabin, enjoying each other’s warmth and company, and exchanging stories and memories by the fire. The sky truly is the limit when it comes to spending your time during a winter camping trip. Ultimately, being aware of these major myths can help you determine whether or not winter camping may be right for you. Of course, you can also find out by reserving a cabin for yourself and exploring all that the winter wilderness has to offer!